Understanding the actual history and use of hudiedao (or Butterfly Swords) reflects the challenges faced by students of martial studies more generally. These short paired swords, with their distinctive D-shaped hand guards, are one of the most commonly seen weapons in the southern Chinese martial arts. Wing Chun, Choy Li Fut, Hung Gar, White Crane and numerous other styles all train with these distinctive blades. In fact, these weapons have become emblematic of southern Chinese martial arts. They have been featured in countless movies, television programs, instructional DVDs and public demonstrations. They have been popularized to the point that they are currently making routine appearances in children’s cartoons. I doubt that it would even be possible to count the number of Wing Chun schools that employ the hudiedao (or Baat Jam Dao, meaning “eight cutting swords”) in their school logos and regalia. These knives function as a symbol of legitimacy on multiple levels. In post-WWII Wing Chun practice and folklore the knives have been reserved for only the “best” and “most dedicated” students. Demonstrating proficiency in their use indicates a mastery of the systems as a whole. At the same time they are undeniably exotic. There is nothing in the traditional western arsenal quite like them. Indeed, they have a number of unique features, and a somewhat shadowy history, even within their original Chinese environment. Butterfly Swords have benefited immensely from the successive waves of popular interest that followed events such as the rise of Bruce Lee or the various Ip Man movies. This once obscure weapon now has its own pop-culture following. This in turn has led to the rise of all sorts of stories and myths concerning the origins of these blades. Some seek to tie them to the Shaolin Temple, and claim that the swords were employed by the monks for protection on the road. Of course the actual historic accounts of the monks of Henan province never mention anything like butterfly swords. Other stories focus on the connections between the hudiedao and secret societies. Occasionally they are called “River Pirate Swords” by western weapons collectors. There is some evidence that both land and sea based bandits did employ these blades in southern China, though they had no special claim on the weapon. It seems that this weapon’s recent popularity has led to a profusion of legends that have obscured and overwritten its more mundane origins. These swords seem to have existed in a fairly stable and recognizable form in southern China since at least the start of the 19th century, and possibly before. In fact, some of the earliest western descriptions of Chinese weapons in the Pearl River Delta region provide us with detailed accounts of these blades including their appearance and use. Chinese language historical and military records have very little to say on the topic of Butterfly Swords. These weapons were never adopted by either the Banner or Green Standard armies. This is precisely what makes the early western accounts so interesting. They stopped to comment on things that were, at the time, either too basic or utterly uninteresting to warrant mention by most educated Chinese individuals. Hudiedao appear to have started off as one regional variation of the numerous double sword traditions that had been popular in the Chinese martial arts going back as far as the Ming Dynasty. While different sorts of double sword traditions are seen throughout the country, the blades used normally resemble typical jians or daos. The shorter blades and D-shaped guards seen on southern hudiedao may be a result of contact with Europeans, though this point is still open to debate. Guangdong was more tightly tied into the global trade system than other areas of China in the 18th and 19th centuries and it is hard to ignore the passing resemblance between these weapons and western military hangers and cutlasses. Far from being the weapon of only the “most elite” warriors, the hudiedao appears to have been popularized and adopted by a large number of 19th century martial artists precisely because it was relatively easy to master and adaptable to a large number of styles. In other posts we have already reviewed how the hudiedao was adopted as a standard sidearm of Guangdong’s provincial militia in the volatile mid 19th century because they could be mass produced and taught to new recruits who probably had some sort of background in village boxing. During the 1840s government trainers provided daily drilling to literally thousands of militia members on the use of the hudiedao in and around Guangzhou. I suspect that this, more than anything else, might help to explain the subsequent popularity of the weapon with local martial artists. After all, individuals like Leung Jan and Chan Wah Shun were a product of this environment. Should we be surprised that the two most commonly taught weapons in Wing Chun (the hudiedao and long pole) were also among the most commonly issued militia arms? Of course double swords are also visually impressive weapons and they have always been a favorite of opera singers. Some of our best early pictures of their use show them in the hands of local performers. The recent resurgence of interest in the hudiedao has been something of a mixed blessing. On the one hand these swords have become a powerful symbol of what is unique and interesting about the southern Chinese martial arts. Yet their original shape, history and capabilities are not well understood. The following post attempts to build on our previous discussions by introducing four new period observations of these weapons. Two of these are early accounts (from the 1830s-1840s) in which western observers describe both the physical appearance of these unique weapons and the social environment that surrounds them. One account focuses on land forces while then other provides a much rarer look at the place of the hudiedao on merchant vessels. The other two witnesses are both late 19th/early 20th century photographs. In both cases these images were published on postcards and have been previously overlooked by students of Chinese martial history. These photos are particularly important because they allow us to match specific examples of these weapons to a known time and place. As important as antique weapons are, they usually come to use as decontextualized artifacts with no known history. Collectors are then left to guess at their age and purpose. Obviously this makes it difficult to reconstruct the social history of these weapons. A great variety of weapons, offensive and defensive, are in use in China; such as matchlocks, bows and arrows, cross-bows, spears, javelins, pikes, halberds, double and single swords, daggers, maces, &c. Shields and armor of various kinds, serve as protection against the weapons of their adversaries. The artillery is very incomplete, owing to the bad mountings of the cannon, and efficient execution is out of the question, from the ignorance of the people in gunnery. Many of the implements of war are calculated for inflicting very cruel wounds, especially some kinds of spears and barbed arrows, the extraction of which is extremely difficult, and the injuries caused by them dreadful. A kind of sword, composed of an iron bar, about eighteen inches long, and an inch and a half thick, or two inches in circumference, is used to break the limbs of their adversaries, by repeated and violent blows. The double swords are very short, not longer in the blade than a large dagger, the inside surfaces are ground very flat, so that when placed in contact, they lie close to each other, and go into a single scabbard. The blades are very wide at the base, and decrease very much towards the point. Being ground very sharp, and having great weight, the wounds given by them are severe. I am informed, that the principal object in using them, is to hamstring the enemy, and thus entirely disable him. Most of the arms made in canton, are exceedingly rude and unfinished in comparison with our own, In the sword-making art they are better than in other departments, but the metal is generally of inferior quality, and the form of these weapons bad; the mountings are handsome, but there is little or no guard for the protection of the hand. When analyzing period documents it is necessary to start by asking a few questions about the background and general reliability of the author. William Wightman Wood (1804-?) is best remembered today as a poet and for the introduction of photography into the Philippines where he worked as a manager of a coffee and sugar plantation. As a young adult he spent a few years living in Hong Kong and Macao in the 1820s and 1830s. While there he started the Canton Register in 1827. This was the first English language newspaper in China and it was made possible through the generous support of James and Alexander Matheson of the notorious Jardine, Matheson & Co. In addition to reporting the news Wood published editorials that bitterly attacked the British East India Company’s monopoly on China trade. He also vocally criticized the concessions that foreign traders were forced to make under the “Canton Trade System.” The paper ran only briefly before the East India Company forced Wood out. He later returned to the region and tried his hand at trade with little success. In 1831 he started a second newspaper, but that project also failed. While he did have extensive “on the ground experience” Wood was notably less sympathetic in his views of the Chinese life and society than some of the other authors I have discussed on the blog. At the same time even his critics conceded that he was a talented writer and artist, and he certainly had an eye for the habits of daily life. When looking at the specific quote above its interesting to note how Wood situates the hudiedao (always referred to in period sources as “double swords”) within his overall discussion of Chinese arms. He spends more time discussing them any other single weapon. He also introduces both the hudiedao and the bar-maces (sometimes called “iron rulers”) after observing the particularly “cruel” nature of some Chinese weapons. In the case of the butterfly swords he notes that one of the goals of these weapons is to “hamstring” one’s enemies. This last point is particularly interesting. One would be tempted to simply dismiss it as a western exaggeration except that the guidebook to Nathan Dunn’s extensive collection of Chinese artifacts, displayed in Philadelphia in 1838 (10,000 Chinese Things by Enoch Cobb Vines), makes exactly the same claim. Dunn was an extremely sympathetic observer and a careful collector. He spent years cultivating relationships throughout local society and his Chinese agents brought him a wide assortment of artifacts and descriptions of their use. I have previously wondered if this association of butterfly swords might not be a remembrance of their use in “hamstringing” as a judicial punishment by the Canton yamen. Some sources indicate that this punishment was used on those who attempted to escape prison or exile before being banned by Chinese legal reformers. However the appearance of this same story in a second source now has me wondering if perhaps the association between this weapon and maiming one’s opponent was not more widespread in 19th century popular culture. More interesting still is the description of the weapons provided by Wood. Many of the surviving hudiedao and early photographs from the mid 19th century have surprisingly long blades. Other examples from that period seem more designed as thrusting weapons. However the swords that Wood observed in the 1830s were much shorter, in his opinion no longer than daggers. I had previously assumed that the hudiedao shrank in size late in the 19th century, though this account seems to suggest that there were always shorter weapons in circulation. Or perhaps the length and heft of these blades was actually increased during the tumultuous 1840s and 1850s? Readers should note that Wood mentions the surprising thickness and weight of the hudiedao blades. Apparently this, and their triangular flat ground profile, are characteristics that have remained stable over time. Lastly his observations about the quality of weapons made during the 19th century (poor fit and finish, but with the nicer swords being notably better) aligns with the description of other early collectors. The Armory of the Wang-Ho as seen on an early 20th century postcard. Note the Hudiedao in the rack on the back wall. Source: Author’s personal collection. This boat would only be second class; the first class would be seventy-eight cubits long; a cubit is fifteen inches English. When fully manned, the crew are as follows: first and second captains, sixty rowers, and ten sailors to steer and shift sails. The crews are residents or natives of Whampoa; and if married, their wives are not allowed with them, lest their presence would damp their courage in danger. One of these fast boats will carry 350 chests of opium, or 400 of Congo tea. The profit from each voyage are arranged thus. Provisions, six dollars per day, or 180 Dollars per month; the proprietor then takes half, and the remainder is divided among the crew; the first captain takes 100 percent., the second captain fifty percent about all others on board. With a calm sea and a fair tide the boat can go six miles an hour without using sails, with a good breeze ten or twelve miles at the same time. At night the “watch” consists of six men relieved every hour. Time is calculated by burning a joss stick (if they have no watch), with four marks at equal distances. A “watch” extends from one mark to another, and is lighted at eight o’clock, so they burn two during the night. The last “watch” ends at four o’clock A.M. The armament is as follows: one cannon, twelve pounder, one do., six pounder; twelve gingalls or small rampart pieces, on pivots; one English musket; twenty pairs of double swords; thirty rattan shields, 2000 pikes, sixty oars; fifteen mats to cover the vessel, two cables, one of them bamboo, and the other coir, fifty fathoms long, one pump of bamboo tubes; one European telescope: one compass, which is rarely used, their voyages being near shore. The crew seldom goes on shore. The captain has no power to strike any of the crew nor put a man in irons, but by common consent the disturbers are put ashore; no articles of agreement are entered into; the captain selects his men, and generally advances them a dollar or two. There is no medicine on board; no one is permitted to smoke opium, unless the boat is anchored in a safe place…..
Robert Montgomery Martin (1801 – 1868) lived a life of adventure and exploration of the sort that was really only possible in the 19th century. Born into a protestant family in Dublin, as a young man Robert was involved with voyages of exploration to Africa, the Indian Ocean and Asia. Later in life he became deeply involved in “the colonial question” and proved to be a prolific writer. In 1844 Martin was named the treasurer of the newly created colony of Hong Kong. However after falling ill and quarrelling with the governor he left the post in 1845 and thereafter turned to literature. Needless to say his extensive travels provided him with a seemingly unending supply of subject material. While well-traveled Martin was certainly not an “old China hand.” He only spent a brief period of time in Hong Kong, though he did get to see the colony at a critical point in its development (he famously predicted that it would fail). Still, he had spent a sizable percentage of his life on various sorts of merchant and naval vessels. That probably explains the detailed interest that he took in the outfitting of a typical south China merchant/smuggling ship. Obviously the important revelation in this quote is that by the 1840s hudiedaos had become a standard part of any ocean going vessel’s armaments. The ship described by Martin above carried a total crew of 72 individuals (including officers). In an engagement up to 20 of those people (more than ¼ of the crew) might be armed with Hudiedao. One would guess that most of the other would carry pikes or man the various guns. While reviewing the 19th century literature I have certainly come across other references to sailors carrying hudiedao in the waters off Southern China. Yet this in the only inventory of a merchant ship’s armory that I have ever seen. For years the received wisdom was that the hudiedao was a product of the late 19th century explosion of interest in the martial arts. It was seen as an eccentric, non-practical, weapon of martial arts masters caught up in their own warrior dreams. These quotes, along with those presented here help to paint a different picture. The hudiedao was in fact one of the most commonly issued and encountered weapons in southern China. The government purchased them in large numbers and issued them to the gentry led militia forces of the mid 19th century. At the same time they were adopted in mass by a wide variety of civilians, ranging from private guards and opera singers to sailors and merchant marines. I would now like to briefly turn my attention to the two images which illustrate this post. 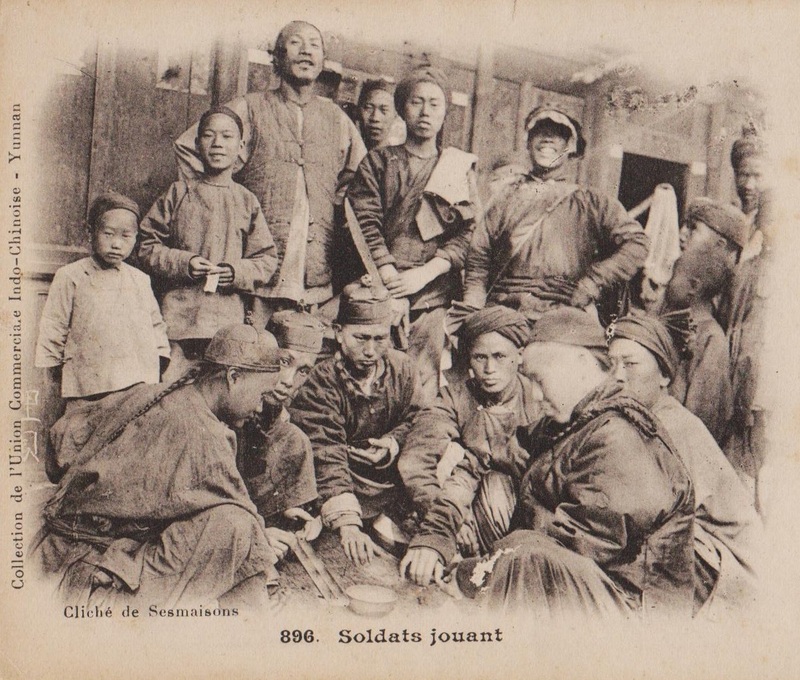 The first of these shows a group of “soldiers” and civilians apparently engaged in gambling in Yunnan province in the early 20th century, prior to the 1911 revolution. Two of the individuals in the center of this frame are armed. The soldier of the right has some sort of ring handled sword (possibly a dadao like weapon) slung across his back. Unfortunately we can’t see its blade. We are more fortunate with the individuals on the left. He is holding a single hudiedao in a reverse grip. One can just make out the shape of the D-shaped hand guard at the bottom of the handle. By my own rough estimate the blade of this weapon is probably about 10 inches (or about 15 cm) long. It also appears to widen about three-quarters of the way towards the point, giving it a flare similar to that seen on many ox-tailed daos (a weapon popular with civilian martial artists and marketplace performers). Given the resolution of the original photograph it is hard to make a definitive statement, but I would hazard a guess that this knife had a steel hand guard. The second image presented in this post continues with the nautical theme introduced by Martin. 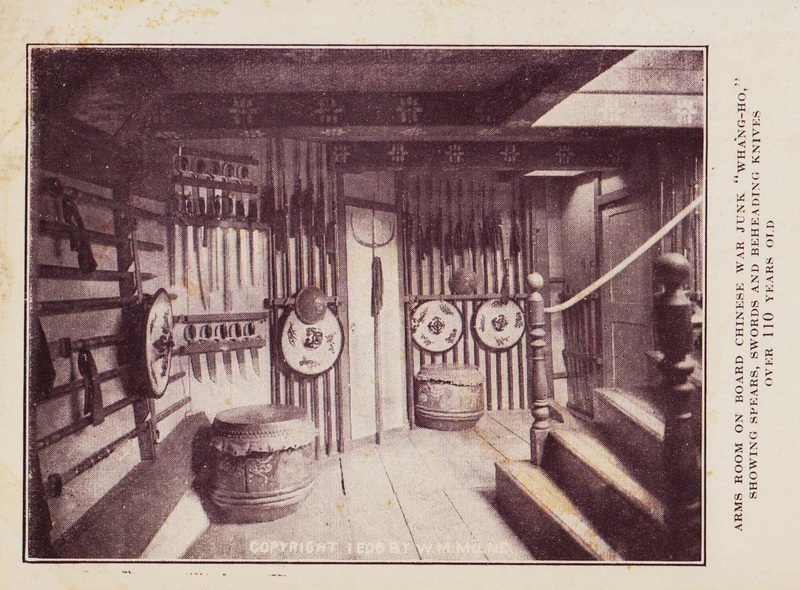 It is taken from a vintage postcard in my own collection showing the arms room of a vessel called the Wang-Ho. I intend to take a much closer look at the strange story of the Wang-Ho and its sister ships in a future essay. However, for our present purposes it is enough to point out that the above image does not show an authentic mid 19th century armory. Instead this vessel was bought in the opening years of the 20th century, refitted in Shanghai and sent to California (by way of Japan) to be a tourist attraction. The ship hosted visitors, featured a crew of “authentic” Chinese sailors, fought mock battles against pirates and introduced many people to a certain vision of Chinese martial culture and the martial arts. Of course the ship also featured a gift shop (where this postcard was purchased) which was actually located in the armory pictured above. I think that we can safely assume that all of the arms in this photograph were either produced in Shanghai at the turn of the century or bought in its secondhand markets. There seems to be some variety in the polearms, but all of the hudiedao look remarkably similar. Given that they are nearly identical to one another I would assume all of these swords were made in a single batch. While these swords have a more pronounced hatchet point than most modern martial arts weapons, their general blade shape is familiar. Compared to the swords of the mid 19th century these are very short and wide. While still capable of a thrust they have blades that would be effective chopping weapons. The D-guards are thick and highly reflective, leading me to suspect that they are brass. Also interesting is the fact that the quillions on these swords is rather short and clearly intended to protect the wielder’s wrist rather than to catch an opponent’s blade. 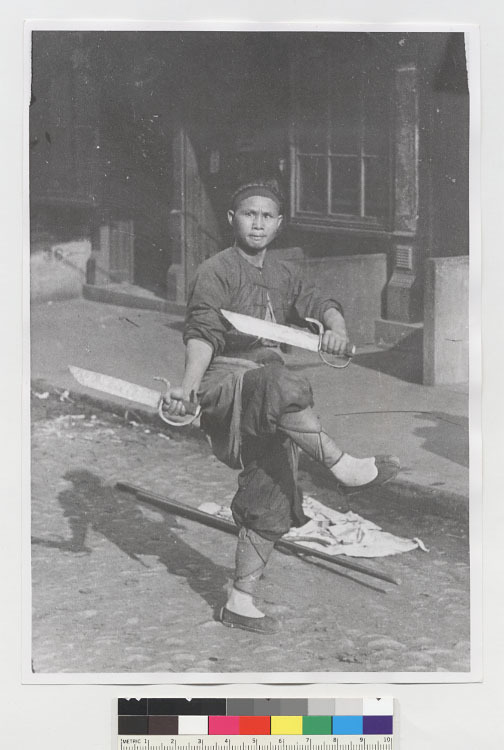 This photograph indicates that the hudiedao that have dominated the modern imagination are a direct descendant of blades made in the early years of the 20th century. The swords that may have been used when these systems were first coming together in the 1840s-1850s were likely somewhat different. A detail of the armory in the Whang-Ho showing the butterfly sword collection. Source: Author’s personal collection. Conclusion: What have we learned about 19th Century Butterfly Swords? One of the ways of judging the maturity of a research program is by looking at how it responds to the addition of new observation. If our understanding of some theory changes radically every time a new piece of information is added, that is a pretty good sign that we are still building an elementary level of understanding. If, on the other hand, most newly discovered observations fit the general pattern that we have come to expect, that indicates that our theories about the past are starting to gain some traction. This post has introduced four new puzzle pieces for individuals attempting to reconstruct the history of the hudiedao and understand how it came to occupy the prominent place that it currently enjoy in the southern Chinese martial arts. The two published accounts originate from the early part of the 19th century (the late 1820s and mid 1840s) while the two photographs capture events in the final years of the Qing dynasty. In general I think that these accounts fit well with the understanding of the butterfly swords that has grown out of the previous posts on this topic here at Kung Fu Tea. The review of a standard ships arms locker certainly reinforces our previous conclusion that by the mid 19th century the Hudiedao had become a standard sidearm for not just martial artists and opera performers but also private guards, militiamen, sailors and law enforcement officers. Further, the weapon was already in widespread use by the 1820s, and possibly earlier. For me the biggest surprise in these accounts was Wood’s characterization of the early hudiedaos as a dagger sized weapon. It is unfortunate that he never gave us the exact measurements as he did for the bar maces. But this might indicate that during the relatively conflict prone mid 19th century these weapons became longer and heavier as they were expected to see actual battlefield combat. Finally the butterfly swords of the early 20th century assumed a set of proportions that modern martial artists would be more familiar with. Their blades remained relatively wide and hatchet-pointed, but they shrank in length to 8-10 inches. Of course given the tremendous variety in surviving 19th century examples, we need to be cautious about extrapolating too much from a handful of observations. While this seems to have been a general trend, it would appear that there was always a lot of room for personal preference in the construction of a hudiedao. As we improve our understanding of these weapons we will simultaneously learn more about the environment that gave rise to martial arts like Wing Chun, Hung Gar, Choy Li Fut and White Crane. This can assist scholars in understanding their place in the development of southern Chinese civil society, and martial artists in assessing their progress as they attempt to understand and master these systems on a more technical level. Arnold Genthe and Will Irwin. Genthe’s Photographs of San Francisco’s Old Chinatown. New York: Mitchell Kennerley. 1913. (First published in 1908). A high resolution scan of the original photograph can be found at the Bancroft Library, UC Berkley). Notice the similarity between these swords and the type that were bought for the Whang-Ho in Shanghai. I know you have a keen (no pun intended) interest in Asian bladed weapons and an awesome collection of late-nineteenth and early twentieth century photographs. I wonder if you’ve seen the sina.com.cn archive of vintage war photographs from China? I was especially struck by the practical and ceremonial uses of swords and horses during the Japanese invasion of China. The symbolic value of the sword is highlighted in this photo of the Japanese surrender in 1945: http://slide.history.sina.com.cn/z/slide_61_55969_43797.html/d/1#p=1 I commend the sina war collection because nobody wrings more out of the visual record of historical events than you. I don’t read much cover-to-cover these days, but your posts are an exception. Thanks so much for the link. That wasn’t an archive that I had seen before. You are right, there is some great stuff in there! I have always been sort of struck by the resurgence of bladed weapons in WWII, whether it was the Kukri being used by Nepalese and Indian soldiers, the Dadao in China or the Katana in Japan. We tell a different story about each of these cases (when the Chinese use swords its because they are poorly armed, when the Japanese employ them its Bushido, when the British do its that because the kukri is an awesome combat weapon). Still, I suspect that all three of these cases are more similar than those narratives suggest, and fundamentally get down to the symbolic construction of identity. Thanks so much for you kind words about the blog. Coming from you that means a lot. I just finished reading your book on Zhen Manqing’s uncollected writings and I loved it. I would like to do an essay on him for my biography series here at the blog at some point. I would love to touch base with you first and get your thoughts on a couple of things.